RFID, or radio-frequency identification, has been around for quite some time. 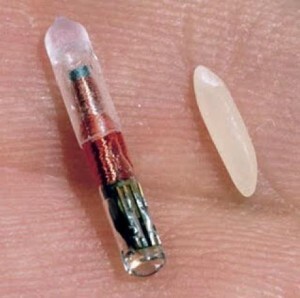 What most people think of when they hear RFID is chip tracking. This innovative technology is used for tracking everything from pills to pets to passports in some of the most interesting ways, it is also used to help ensure the more natural use of prosthetic limbs. Here are ten more interesting facts about the amazing RFID. Fact 1: Traveled outside of the country in the past few years? If you have an American passport, then you’ve traveled with an RFID chip. Located on the page with all your other information is an RFID chip that will track your passport if it’s lost or stolen. Fact 2: RFID helps scientists fight extinction by tracking animals to learn more about their habits and environments. Fact 3: Bananas, Carrots, Corn. 12% of perishable foods are lost each year during shipping. That’s $500 billion dollars. RFID chips can help fight this loss by tracking each and every product and passing the savings down to consumers. Fact 4: Most clothing contains RFID for faster and easier stocking and to prevent shoplifting. Fact 5: RFID saves lives. It validated the origin of medicine, fighting the crime of counterfeit medicine. Fact 6: Who hasn’t had their luggage lost at least once? With the implementation of RFID chips, tracking luggage is much easier. Fact 7: You’re standing in line on at the ice cream shop on the hot summer day and when you finally reach the counter, asking for two scoops of Black Raspberry, you’re told their all out. Now you’re holding up the line. With RFID, this won’t ever happen again. The tubs of chipped ice cream can be ‘œhooked up’ to the display window so when the store runs out of that flavor it is instantly updated on the overhead electronic menu. Fact 8: RFID enabled pathways are currently being enabled and tested for the blind. Fact 9: No more lines! RFID chips can be used for easy check out at libraries and shops in our speedy, cashless society. Fact 10: Bee conservation. Since pees pollinate most of our food, we really need them around. RFID allows scientists to track bees, learning which plants they rely on most for survival.